Olumide Popoola, Ngartia for Goethe’s Artistic Encounters. 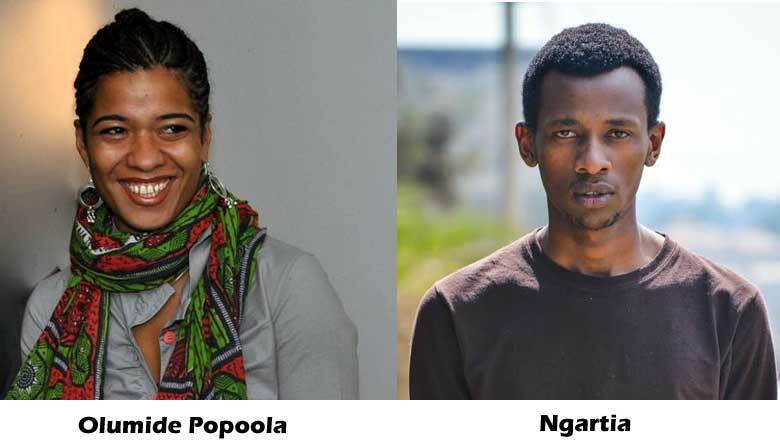 Writer and speaker Olumide Popoola and performance poet Ngartia are the featured artists at Goethe-Institut Nairobi’s Artistic Encounters on Thursday September 13, 2018. The event will be moderated by blogger James Murua. In Goethe-Institut Kenya’s Artistic Encounters, a project curated by Zukiswa Wanner, two artists of different genres meet and share their art in front of an audience. Started in 2017, the project has had artist Victor Ehikhamenor and poet Koleka Putuma, trumpeter Christine Kamau and poet Philipp Khabo Koepsell, novelist Lola Shoneyin and storyteller Maimouna Jallow, as well as author Angela Makholwa and actress Patricia Kihoro feature. The first edition of Artistic Encounters for 2018 kicked off in May with novelist, short story writer and academic Pede Hollist and actor Hana Kefela in May perform to a packed house. In June, mbira player Prudence Katomeni and poet Adipo Sidang’ performed whilst the featured acts for July were novelist Niq Mhlongo and actor Nick Ndeda. The September edition of what is becoming a very popular event in Kenya’s literary calendar will return to Maendeleo House in Nairobi on Thursday September 13. Those who attend the event will witness Ngartia doing his rendition of Olumide Popoola’s novel When We Speak of Nothing which was published in 2017. Olumide Popoola is a London-based Nigerian German writer and speaker who presents internationally. Her novella, This Is Not About Sadness, was published by Unrast Verlag in 2010. Her play Also by Mail was published in 2013 by and the short story Collection Breach, which she co-authored with Annie Holmes, in 2016. Ngartia is a Kenyan Performance Poet who is known universally for Too Early For Birds a show based on stories from award winning blog Owaahh which shares stories from Kenyan history. The performances at the Goethe-Institut start at 6:30pm. Next Next post: The Commonwealth Short Story Prize 2019 seeks your stories.